Valentine’s Day is no longer a holiday that is limited to the USA. Love is celebrated all over the world and February 14th tends to become more and more popular worldwide. Celebrating love itself, fusion Hotel Prague launches three romance inspired rooms just in time for Valentine’s: Love fusion, Rock fusion and The Vintage Room. These three new rooms aren’t just for Valentine’s, they are also a special gift of the hotel for its guests as the hotel’s one year anniversary almost coincides with Saint Valentine’s. The special elements that set these rooms apart – the bedside tables from crates, the headboard made of 100-year-old floor planks decorating The Vintage Room, the vinyl packaging adorning the walls of the Rock Room, will enable hotel guests to get the most out of the rooms’ view. The heart of Prague can be admired from each room as they are large and have exposed windows. 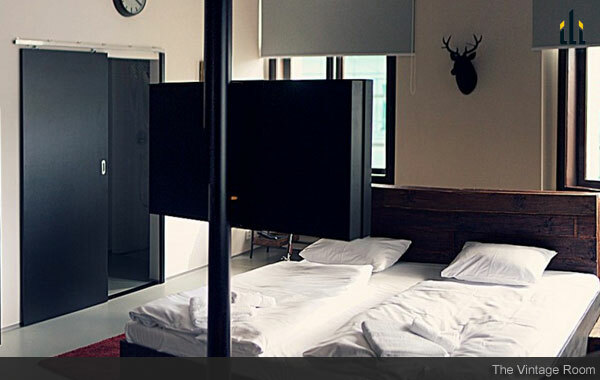 Already recognized for its funky interiors, fusion Hotel Prague continues to redefine hospitality standards offering a space where travellers can enjoy themselves. Those who choose the Czech capital for this Valentine’s Day will definitely be wooed by the new rooms which look amazing. The hotel offers a wide range of spacious rooms for every budget ranging from special rooms created for backpacking travel fans to exquisite accommodation appealing to luxury loving, extravagant people. fusion Hotel’s guests can also enjoy the only rotating bar in Europe, a unique Czech gastro bar, Epopey, and a Shisha-smoking room. Tech savvy guests who want to keep in touch with the world and its latest developments will be happy to discover there is free WiFi all over the hotel and that free guest PCs are available. fusion Hotel also has a Skype box enabling its guests to communicate with their friends and family, a Playroom with interactive game and many other facilities aimed at making each guest’s stay as comfortable and pleasant as possible.